During the 2016–17 school year, my school’s principal told me she wanted to improve her students’ completion of the books they were supposed to be reading. Most of the reading was being recorded in Renaissance’s myON, which is a personalized learning online application. Previously, teachers had been given a quick-start manual and a 1-day training session from the myON project manager on how to show the students how to read the digital books. Both of those methods had failed to show other features that could have shed light on what was really happening when students were reading—or shall I say, not reading—myON’s digital library. At the start of the school year, my principal asked me to show the teachers how to really use myON to improve student outcomes. The school is a Title 1 School, meaning that Title 1, Part A provides financial assistance to schools with either high numbers or high percentages of children from low-income families to help ensure that all children meet the challenging state academic standards. Since there were a small number of physical books in the school library, the school community depended on myON to provide reading materials for the students (more than 7,000 digital books for grade levels pre-K–6th). When students would finish assignments derived from the school system’s curriculum, teachers would tell them to read books in the myON collection. After the school system’s ESSA (Every Student Succeeds Act) and Title I department ran a report to see how many students—from which schools—were using myON, our school was found to be one of those in the system sorely lacking reading completion of a high number of books that the students had started. If the students in our school did not finish the ebooks they were still reading, the school would lose the funding for them to use myON. The principal looked to me to lead the way, since I was a library media specialist. But some schools might also call me an educational technologist, instructional technology specialist, or school librarian. And it would take all those skills to get this assignment completed. So wearing all my hats, I turned to developing a program to help teachers master myON in order to get the students to complete their reading assignments. As noted previously, the teachers were required to attend a 1-day training session and were given a quick-start guide that presumably would be enough to enable them, in turn, to instruct students on how to read the digital books in myON. I participated with the teachers and took notes on what the myON project manager was emphasizing in the training session, and I reviewed the quick-start guide. Quite frankly, neither source helped me. I needed to find out from each teacher how he or she was actually using myON in order to understand the situation. Here are my step-by-step instructions on how to use the programmed modules in myON to help teachers produce better student grades—uninfluenced by grade inflation—for the benefit of students, teachers, parents, and administrators. The school system subscribed to myON because it is purportedly of use in helping determine the personalized learning needs of each student. myON allows students to select what books they want to read for the length of time they want to read them, while showing the teacher where their strengths and weaknesses are in the independent reading sessions. However, the teachers had to be shown how to use the application to track student progress. In my capacity as library media specialist, I monitored students’ independent reading during library media programs, between October 2016 and January 2017. Through these observations, I found that the students were skipping digital pages. 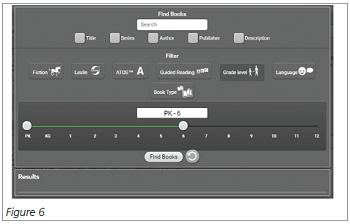 If they did get to the end of the digital book, they did not hit the End button (Figure 1), so that myON could record the book as finished in their records. The end result was myOn recorded that the students had not finished books that they had actually read. 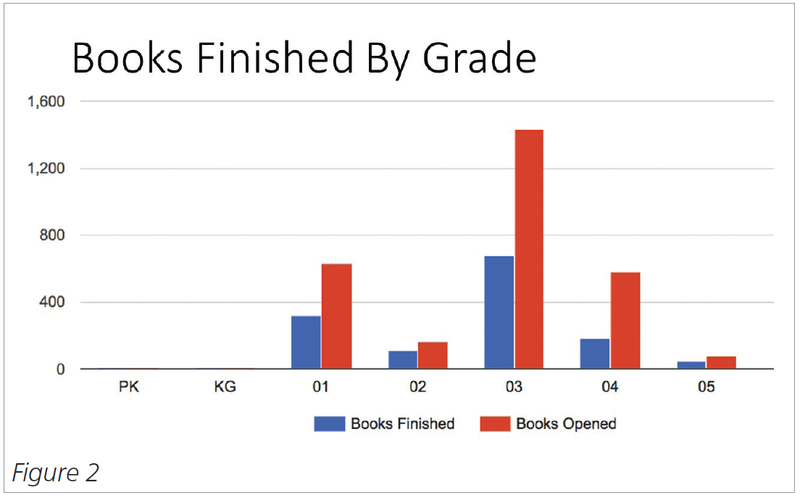 As you can see (Figure 2), the students had more books opened (shown in the color red) than books they had finished (shown in the color blue). I reported my findings to the faculty members and principal in the library media center in February 2017. After presenting my findings, it was agreed that I would create subject-related lessons that corresponded to the PARCC curriculum taught by the teachers for the remainder of the school year. The lessons would be for the third- through sixth-graders. The subjects would be a Martin Luther King Jr. essay, solar energy, Native American culture, and Hispanic- American culture. Wearing my educational technologist and instructional technology specialist caps, I created lessons to incorporate a grade-level book with narrated audio, highlighted vocabulary, multiple-choice Lexile tests, and an essay (problem application sections). The lessons would be created by selecting books on a subject. 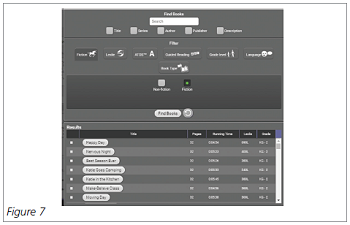 You can select books by first creating a project (Figure 3). Next, click on Classroom, Projects, and then Create New Project. The New Project worksheet will display. 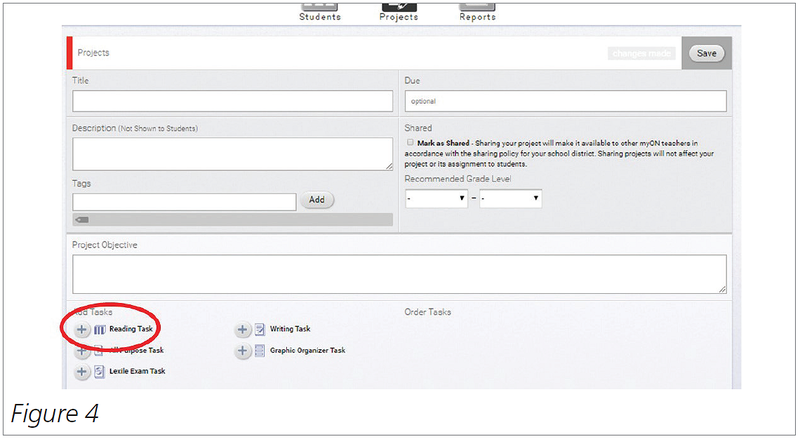 Fill in the information you want teachers and students to know about the project, and click on Reading Task (Figure 4). Another window opens up in your same screen that allows you to name this reading task and list the objectives of the reading task (Figure 5). Click on Manage Books, and the screen that looks like Figure 6 will display. 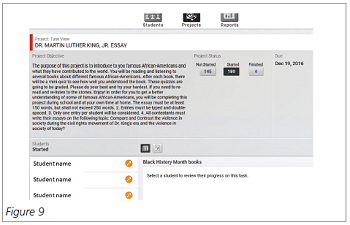 You can then select the level of difficulty and type of books that you want your students to read in this project. 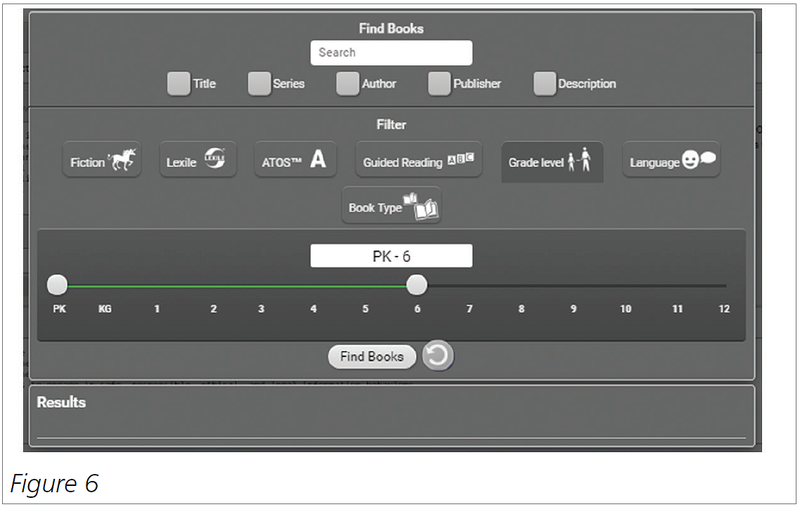 Click on the Find Books button, and then check the boxes of the books that you wish to include in the project (Figure 7). Click on the outside of this screen and you have created one project. 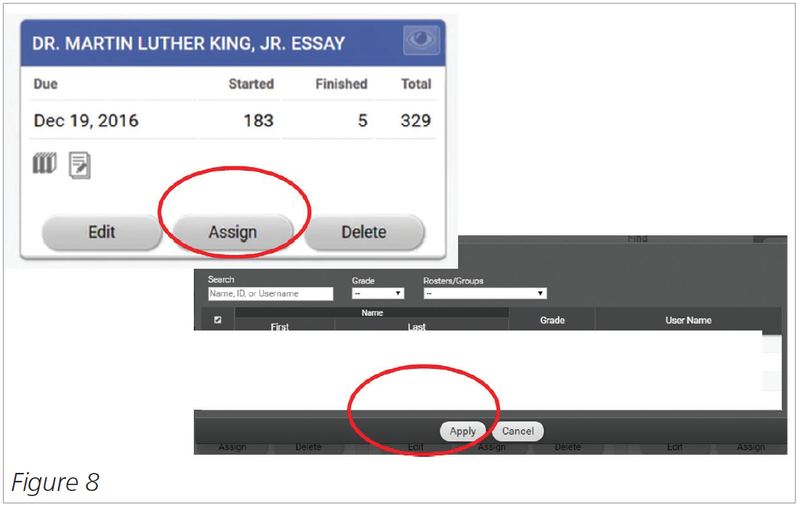 You can assign the project by clicking on Classroom and then Projects. 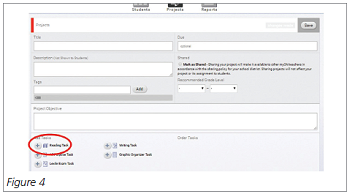 Click on your project, and click on Assign. Here, you can select the students for your project (Figure 8). 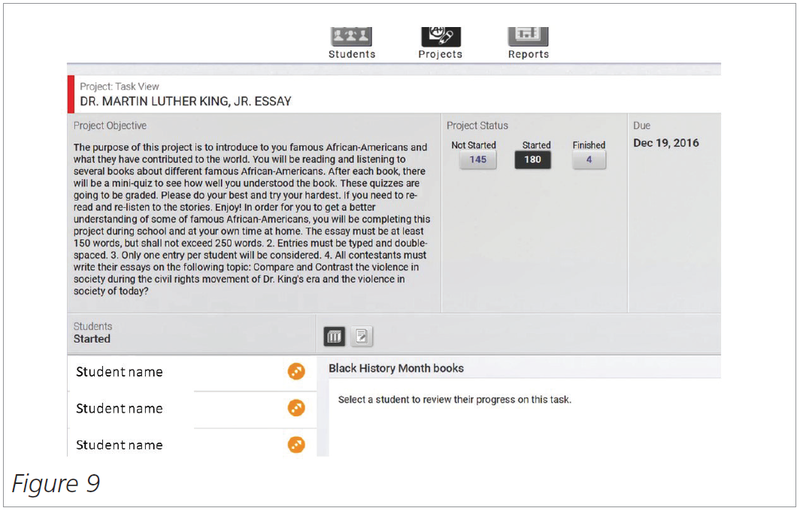 Before compiling the data for the reports to distribute to faculty members and the principal, I looked daily at the students’ progress for the projects that I had created for them to work on in the library media center. Since the Martin Luther King Jr. project included an essay assignment, I would be responsible for reading through them (Figure 9). As assigned, the essay was to be based on the books that I had selected in a previous step. Students would be automatically quizzed on each book when completing the reading portion of their assignment, and their reading activity would show up in their myON Reader profile, which I could review by clicking on a student’s name. I could collect weekly reports about the students for each teacher. 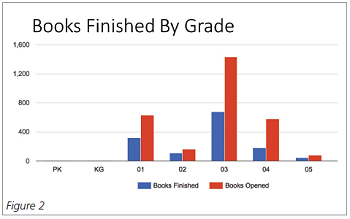 Systematic data would be shared about reading success (quantity, time, growth) with students in the library media center. This could be retrieved by clicking on Classroom and then Reports (Figure 10). You can select what type of report you think would most benefit your teachers and keep your principal informed. I used the following reports to give to each teacher and the principal: Core, Quizzes, Reading Habits, Most Popular Categories, and Lexiles. The core report can include the number of students, the number of books read, the pages read, the number of days and minutes spent reading, and the averages for the class, including average Lexile. My programming and usage of myON was through a library media center (the school library) in a Title 1 school. The reporting features were used in order to allow teachers, parents, and the principal to know the reading comprehension progress of every student in the school. It also produced grades (from the comprehension and Lexile quizzes) that the teachers could add on to their grade for each student. Teachers could use the myON grades to supplement the weekly grading that needed to be produced to show the progress of every student and to stop fears of grade inflation. Grade inflation is defined by one teacher as this: “A well-deserved F would sometimes become a D- as the time came to actually turn in the final grades. Throw out the lowest quiz grade, give a little extra credit, and … the student’s performance wasn’t so bad after all. Eventually … a B+ just looked better than a B- … giving more pluses and fewer minuses” (Cizek 1996). myON eliminates questions of grade inflation because the application conducts unbiased evaluations. After each book the students finish, the system administers quizzes that measure their reading comprehension and assess reading skills development. Teachers have been using three factors to grade: “1) formal achievementrelated measures (for example, attendance, class participation, extra-credit work); 2) informal achievement-related measures (such as answers to in-class questions, oneon- one discussions); and 3) other informal information (impressions of effort, conduct, teamwork, leadership, and so on)” (Cizek 1996). myON delivers pure data. By using data from myON, the feelings teachers may have for students are not factored into the students’ grades. Grades are created from the students being tested on the digital books they had been reading through quizzes that monitor basic comprehension and benchmark assessments to target reading selections and monitor reading improvement—all correlated to state and Common Core State Standards. “The Lexile Framework for Reading is a psychometric system for matching readers with texts of appropriate difficulty” (Sanford-Moore 2013, p. 3). Usage of myON needs to be encouraged daily in order for students to develop their reading skills on all of the subjects pertinent to their school’s curriculum. Based on my observations, if students are not encouraged to have myOn as part of their class schedule, they not only forget to use it, but they forget how to use it. When it is not incorporated from within the students’ class schedules, I have seen students select the same book over and over again to read in order to satisfy their teachers’ required reading. Teachers have to review daily what the student has read to make sure there is progression and not a lot of repetition of books. By using myON, students will be able to work independently on their reading comprehension skills. In order to promote this, teachers need to supply a weekly grade of the students’ progress to the parents and/or the school’s principal. Once a reading pattern is established for each student, then his or her reading comprehension skills should show signs of improvement, if needed. In the past, students were assigned myON to read whatever books they wanted without any supervision from the teacher. That was insufficient. Teachers have to be monitoring the students’ reading progress in order to know if they are improving or not. Adopting myON might also prevent unmerited school firings of teachers for having too many students failing in class. One teacher was fired, according to one report, “because she gave too many students D’s and F’s in her Algebra II class. These grades distressed school administrators, who worried that they would damage students’ self-esteem and turn them off to math altogether. They blamed [her], saying that the D’s and F’s—‘negative grades,’ in their terminology— proved that she was an incompetent teacher” (Bradley 1993). By using myON properly, it doesn’t have to be that way. Abel, N. (Feb. 17, 2016). “What Is Personalized Learning?” iNACOL. Retrieved on Sept. 28, 2018, from inacol.org/news/what-is-personalized-learning. Barata, M.C., Calheiros, M.M., Patrício, J.N., Graça, J., and Lima, M.L. (2015). “Evaluating the Impact of National Educational Policy to Reduce Retention and Increase Achievement in Compulsory Education.” Elementary School Journal, 116(1), 149–171. Retrieved from ezproxy.umuc.edu/login?url=http://search.ebscohost.com.ezproxy.umuc.edu/login.aspx?direct=true&db=eric&AN=EJ1077335& site=eds-live&scope=site. Bradley, A. (Sept. 13, 1993). “Teacher’s Firing Spurs Debate Over Standards, Expectations,” Education Week. Retrieved on Sept. 28, 2018, from edweek.org/ew/articles/1993/09/15/02algebr.h13.html?print=1. Barrett, D.E., Casey, J.E., Visser, R.D., and Headley, K.N. (2012). “How Do Teachers Make Judgments About Ethical and Unethical Behaviors? Toward the Development of a Code of Conduct for Teachers.” Teaching and Teacher Education: An International Journal of Research and Studies, 28(6), 890–898. Retrieved from ezproxy.umuc.edu/login?url= http://search.ebscohost.com.ezproxy.umuc.edu/login.aspx?direct=true&db=eric&AN=EJ969106&site=eds-live&scope=site. Carifio, J., and Carey, T. (2013). “The Arguments and Data in Favor of Minimum Grading.” Mid-Western Educational Researcher, 25(4), 19. 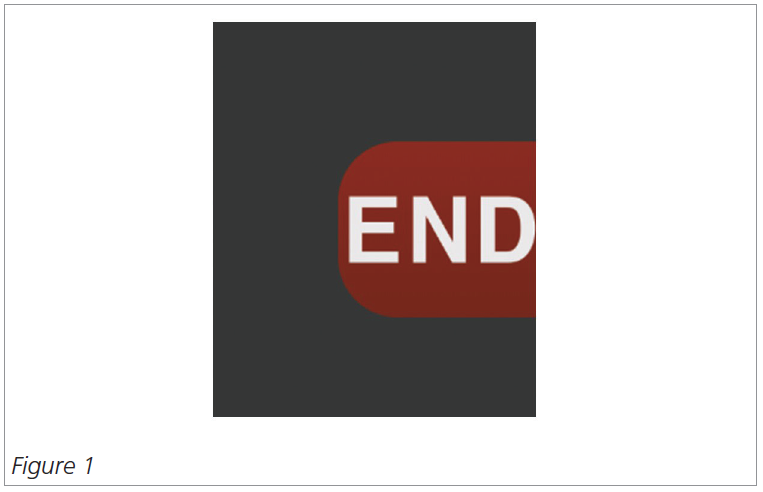 Retrieved from ezproxy.umuc.edu/login ?url=http://search.ebscohost.com.ezproxy.umuc.edu/login.aspx?direct=true&db=edo&AN=94935842&site=eds-live&scope=site. Cizek, G.J. (April 17, 1996). “There’s No Such Thing as Grade Inflation,” Education Week. Retrieved on Sept. 28, 2018, from edweek.org/ew/articles/1996/04/17/30cizek.h15.html?print=1. Renaissance. (2018). myON. Retrieved on Oct. 21, 2018, from myon.com. Sanford-Moore, E.E. (June 24, 2013). 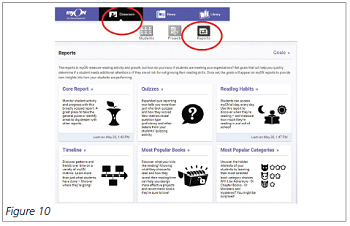 “The Lexile Framework and myON Reader.” Retrieved on Sept. 29, 2018, from about.myon.com/sites/default/files/attached/White%20Paper%20-%20Lexile%20Framework%20and%20myON%20-%20Sanford-Moore.pdf. Sawchuck, T. (Sept. 25, 2018). “How to Make Reading Relevant: Bring Job-Specific Texts Into Class,” Education Week. Retrieved on Sept. 28, 2018, from edweek.org/ew/articles/2018/09/26/how-to-make-reading-relevant-bring-job-specific.html. Schneider, J., and Hutt, E. (2014). “Making the Grade: A History of the A-F Marking Scheme.” Journal of Curriculum Studies, 46(2), 201– 224. Retrieved from ezproxy.umuc.edu/login?url=http://search.ebscohost.com.ezproxy.umuc.edu/login.aspx?direct=true&db=eric& AN=EJ1029383&site=eds-live&scope=site. Wan, T. (Feb. 21, 2017). “Capstone Sells Digital Reading Platform.” Retrieved on Sept. 28, 2018, from edsurge.com/news/2017-02-21-capstone-sells-digital-reading-platform-myon-to-private-equity-firm. Zirkel, P.A. (March 8, 1995). “Grade Inflation: A Problem and a Proposal,” Education Week. Retrieved on Sept. 28, 2018, from edweek.org/ew/articles/1995/03/08/24zirkel.h14.html?print=1. Lorette S.J. Weldon (blazer095@msn.com), Ed.D., M.L.S., B.S.I.F.S.M., B.A., is the library media specialist and an adjunct associate professor at University of Maryland University College. She has more than 20 years of experience as a teacher, speaker, and librarian. Weldon is the author of many books and articles on a wide variety of educational topics (such as her latest book, Making and Tinkering for STEM Projects With a Media Specialist). Her blog is at librariansandlibrarymediaspecialists.blogspot.com.